Lone Ranger #10 Cover Art! The cover art for #10 is up! Quite a departure from previous covers. I don't know if it's going to stay just red-on-white like it is, but it makes for an interesting cover. I rather like the simplicity of it, to be honest. BEAUTIFUL...thanks Mikey I had not seen it...your promptness has made my day! That is such a great cover ....now where's that final art for Ranger and Tonto # 1.....ahhh just kidding, I told Joe I'd be patient from now on! WHAT A GREAT USE OF THE MASK....drawn in blood! Last edited by Ranger01; 10-18-2007, 02:24 PM. For that matter, when will LR&T be added to the titles page? I almost forget it's coming because it's not listed with the rest of the Ranger stuff. I don't care how dark it gets in Alaska...Mikey has to be a beacon in that darkness! I don't know that there's any exact science as to the way in which titles makes their way to the titles area - though as far as I know they're always up well before the books are to be available. For me, the best of the covers was the one on #0, the FCBD issue. Since then they've gone steadily downhill. I really don't like this one at all. It looks like someone threw it together as an afterthought. I hate to sound negative, but I really liked bright colors, vivid expressions and lots of action. As with all things Art, I reckon it's a matter of personal taste. I like this new cover - the stark colours and image. It's simple and understated, yet at the same time eye-catching and bold - and it's surprising just how much thought and effort it can take to achieve that. I hate correcting anyone but you do know that was Joe you were replying to, not Art. good art or bad, it makes me *extra hungry for the story that goes with it!!!! 'With a cloud of dust and a hearty hi-ho Silverâ€™, The Lone Ranger rides into his next adventure with a very rare black and white variant cover prepared exclusively for Comic Collector Live. John Cassaday, Eisner Award Winning artist, has been commissioned by Comic Collector Live for the limited (250) black and white variant cover of the Lone Ranger (#10) series from Dynamite Entertainment. The Lone Rangerâ€™s second exciting story arc featuring The Lone Ranger and Tonto concludes here in part 4 of this 4 part adventure! Lone Ranger writer Brett Matthews and artist Sergio Cariello also received Eisner nominations and, along with art director and cover artist John Cassaday, have produced a series that is capturing the imagination of many generations of comic book enthusiasts. Comic Collector Live will be offering the special limited variant issue exclusively on its website www.comiccollectorlive.com and expects to offer a select number of issues at comic book conventions such as Wizard World Texas in Arlington, November 16-18th. I just placed my order through the link you provided. Wow! That certainly is different. Give them an 'A' for doing something totally different. I like it! 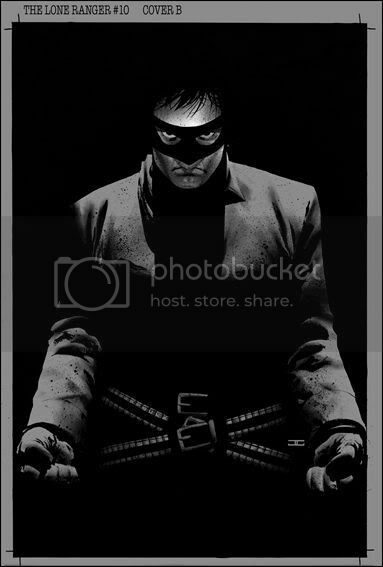 The Lone Ranger rides into his next comic book adventure (#10) with a very rare black and white variant cover that portrays the masked man in what some fans say is a â€œdark and dismalâ€� manner and should be avoided like the plague. (Eisner Award Winning artist) rendition from Dynamite Entertainment is getting powerful â€œlove-hateâ€� reactions from Lone Ranger fans. I do not get it, 'bad boy' 'punisher' avoided like the plague...what on earth? As head honcho of the Ranger Fan Club you gotta explain. I get the impression that if die hard fans had they're way Rob and Laura Petrie would still be in separate beds. Is this B & W cover really a source of such angst. This is the same Ranger people but you're getting a dose of reality (so to speak). A young man has his father, brother and friends gunned down in a cold blooded ambush and these die hard fans see cover art that portrays the anger those killings have manifested,as not relative. The artwork portrays an emotion that has to and must exist, as this young man attempts coming to grips with feelings of hate,revenge and justice. Why such nievete, if any of them put themselves in the Ranger shoes do they really believe that after the violent death of a father or brother, they would immediately get a friend, go out and calmly find the bad guy, quietly convince him what he did was wrong and then turn him over to the law and then go on with their lives, no they would spend days running the gamut of emotions and I am sure at some point they would be staring into a mirror and seeing anger on their face and darkness around them, much like this cover they are so angry about. Yes they would get over the pain and hopefully the hated GIVEN TIME. Joe, tell your die hards, emotions are important and they get us through, not over night, not in a month and not in 9 issues of a comic book. What is being presented in this art is a human being showing his emotions at a point in time, why these fans do not see that is beyond me! Last edited by Ranger01; 10-23-2007, 07:40 AM. Hey Ranger01, I really can't speak for all the die hard fans because we're all individuals with our own opinions. I like the B&W version much better than the red and white one. My experience in this gig is that there are those who don't want the Lone Ranger to be anything more or less than he was under Clayton Moore or Brace Beemer. I think DE has experienced this with BSG. It doesn't matter what you do or how well you do it, there is a certain element that just won't like it. This book has its fans and detractors and always will. Had DE done a classic Clayton Moore style comic, a certain element would hate it because it wasn't anything new or interesting. For me, I love a good story. That's what this book has going for it. It's a good tale, whether it's the Lone Ranger or not.